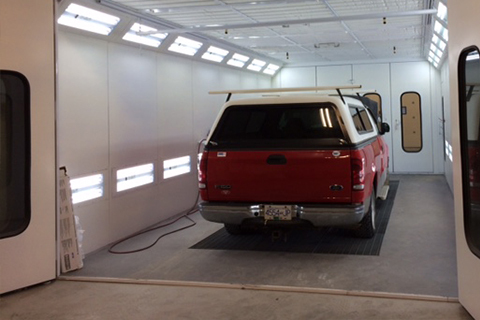 Neighbourhood Auto Body Collision Center proudly uses PPG’s Envirobase paint system. This is their top quality, state of the art environmentally friendly paint guaranteed to match any new model colour. 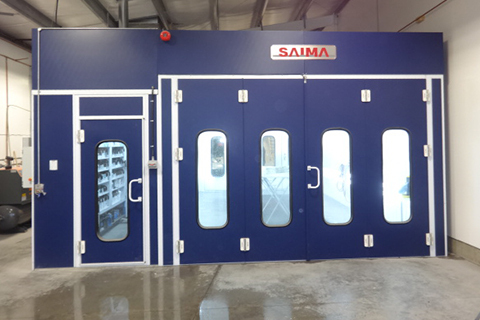 We now house a brand new, state of the art, Saima Accudraft Titan, full downdraft, drive-through style spray booth. This is the best spray booth money can buy. It provides a completely controlled, dust-free environment and with the 1.5 million BTU bake cycle this booth will pump out perfect quality paint jobs as fast as our refinish technicians can spray them, thus getting our customers back on the road a lot sooner than our competitors. We have a number of ways that we can match the colour on your vehicle. Every vehicle has a paint colour code on an information decal placed accordingly depending on the vehicle. We take that code and enter it into our computer which is linked up to the PPG colour database. 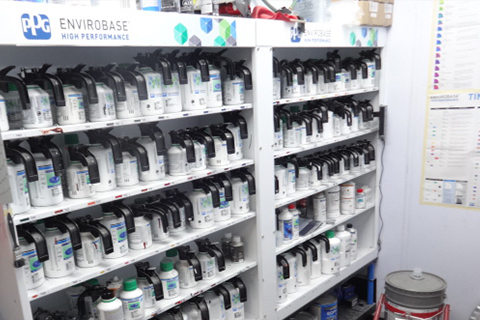 Within a matter of minutes we have the exact mixing formula for the colour on your vehicle. If your colour is from an older model or a custom colour we have an extensive colour chip system that can at the very least give us a starting point. Our painter can then tint the colour by eye until it matches. Another method of ensuring that your colour matches is called “blending”. 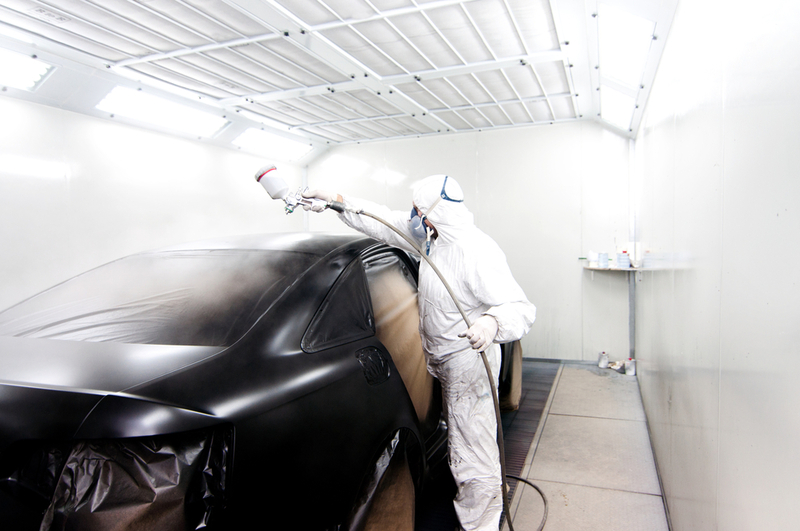 How it works is simple: the majority of automotive finishes are applied in 2 stages. The first stage is the base, or colour, coat and the second stage is the clear coat. When a panel is replaced or repaired resulting in new colour being applied directly beside an adjacent undamaged panel we prep the adjacent panel for paint as well. When the painter applies the base/colour coat he mists or “blends” the colour into the adjacent panel as well. Once the base has dried both panels are clear coated for a seemless finish. A common question we are asked is “how much for a paint job on my car?”. We will only do TOP QUALITY complete paint jobs for the serious shopper. Most paint jobs start at around the $5000 mark and go up from there depending on what you want, how much body work there is, what parts need to be removed etc. Unfortunately the days of the $600 paint job are gone. Please don’t hesitate to contact us with any enquiries regarding paint work. We’d be happy to answer any questions or concerns you may have.